Located just miles away from the master-planned community of ArrowBrooke is one of the biggest lakes in Texas, Lake Lewisville! For those who enjoy active living, it’s the perfect place spend some time with family, celebrate a holiday or simply enjoy time in and around the water, especially in the Texas heat. Whether you have a boat or not, Lake Lewisville is a great place to spend a morning or entire day fishing. You’ll find some of the most popular fish in Texas such as spotted bass, white & hybrid striped bass, white crappie, blue & channel catfish and largemouth bass! If you don’t have a boat, there is a fishing barge open to the public. For those looking to hit the links, you’ll have four great golf courses near Lake Lewisville! You’ll never go hungry if you’re hanging out at the lake. From Sneaky Pete’s to Captain Jack’s Bar & Grill, you’re sure to be in taste bud heaven! What’s a lake without swimming? 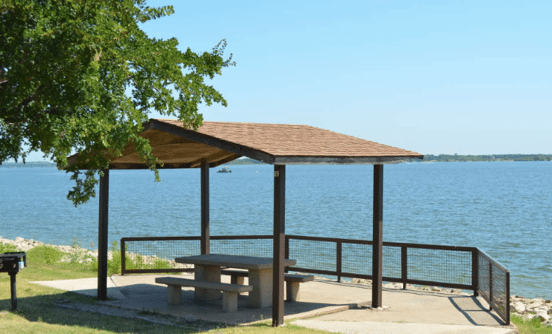 Lake Lewisville has six designated swimming areas and beaches! You’ll be able to bring the kids out to enjoy a day at the lake, build sandcastles, and enjoy some quality family time. Since it’s summer, party cove is where you want to be on Lake Lewisville! Active living and camping go hand-in-hand. You don’t have to travel far to get the full experience of the great outdoors of Lake Lewisville! Pitch a tent, bring the smores and get ready to interact with mother nature at one the six campsites of Lake Lewisville. There is plenty of fun to be had at Lake Lewisville, and you won’t have to travel far to find it. Stop by ArrowBrooke and visit the newly opened model homes to find your new paradise!